Heat oven to 350°F. In 3-quart saucepan, stir all filling ingredients. Heat to boiling over medium heat, stirring frequently. Meanwhile, in large bowl, mix brown sugar and flour. Cut in butter with pastry blender or fork until mixture is size of peas. Separate dough into 10 biscuits; cut each into quarters. Add dough pieces to brown sugar-butter mixture; toss to coat. Pour hot filling into ungreased 8-inch square (2-quart) glass baking dish. Sprinkle biscuit pieces over filling. Pour remaining brown sugar-butter mixture over biscuits. Place baking dish on cookie sheet. Bake on middle oven rack 18 to 22 minutes or until top is golden and biscuits are cooked through. Cool at least 20 minutes. 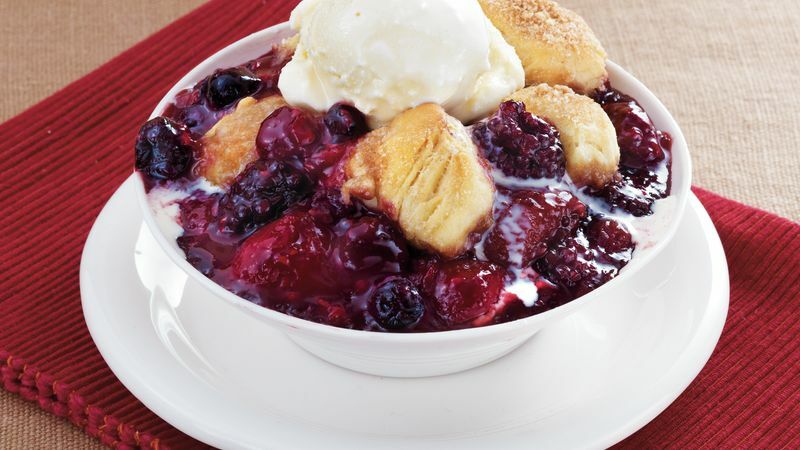 Serve warm cobbler in bowls with ice cream. Instead of whipped cream, top each serving of warm cobbler with ice cream or vanilla yogurt. Choose your favorite combination of berries for this cobbler, such as blueberries, blackberries, raspberries and/or strawberries. Look for bags of frozen mixed berries in the freezer case of the grocery store.